on the woodside. : *bastille meal. 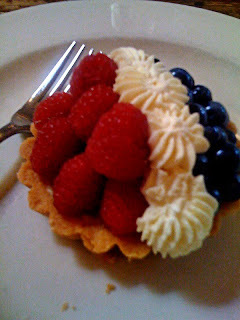 Tuesday, July 14, 2009 Labels: eateries. Today has had a certain je ne sais quoi, a mixture of serendipity and surrender that is unmistakably French. In short, this Mardi is gras. It started with an unexpected "Lunch?" text from JLB. Sacrebleu! One of my three favorite meals! We decided to hit up Chez Fonfon, where we discovered that today is, in fact, a holiday for les Français, a day when the population commemorates some sort of deadly battle, and also the forgiveness of traffic tickets. And who should be there, sidled up to the long wood counter, crackin' wise with his lady sidekick? Mon père! He politely informed me that all the menu items were delicious, but that if I did not order the prix fixe Bastille Day offerings, he'd deny my existence for the rest of my days. Either that, or I started to glaze over at the prospect of five courses (at LUNCH. INSANE.) and stopped being able to understand him through the foggy chorus of angels in my head, and he decided to pretend he didn't know me. 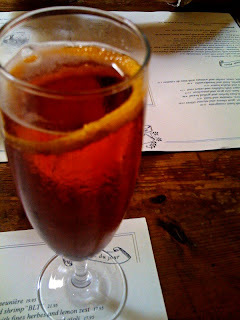 Kir royale, a pretty pink blushing thing with a dainty garnish of orange peel. Just right for a dainty Southern girl who knows better than to indulge in heavy boozing in an afternoon hour. Or, in the absence of dainty Southern girls who have any sort of moral compass regarding liquor, for me. Ah, yes, that's just right. Itty bitty tastes, perfect for my delicate constitution and fragile nature. 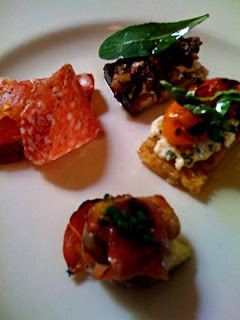 A pretty fan of charcuterie; tiny tartine corners with olive tapenade and goat cheese/melty tomatoes, respectively, garnished with ribbony herbs; and a rotund little fig hugged by delectably thinly sliced prosciutto, cooked to salty heaven. No wonder French women don't get fat. Sainte mère! I'm supposed to eat that entire thing? 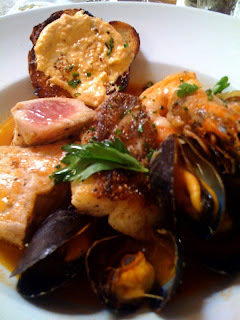 Shrimp, mussels, tuna, snapper, and buttery toast with rouille floating in a warm, complex broth that tastes perfectly briny without a hint of fishiness? It is here that I should note the most horrible of circumstances: Surrounded by tremendous food and kind service in a room full of hushed conversation, I pulled out my camera to capture every morsel. Battery? Dead. How do you say ggooddaammiitt!! in French? The iPhone tried to keep up, but it was no match for the texture and color on these plates. A vast frog-leg conspiracy, I fear. Ooooouch. Thank heavens for yielding fabrics. 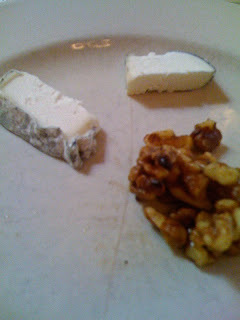 This was cheese. I don't know what kind. I ate it. It was benignly ridiculous at this point in the meal, and for that I give it great kudos. Seriously, uncle. I don't really do dessert. I didn't need to hoover this with any great speed. But ... there are bright berries (not rendered by heinous photography). There is a flaky, buttery crust (not rendered by heinous photography). There is a perfect row of soft, creamy white rosettes (not rendered by heinous photography). I was going to bring home the leftovers, but the waitress didn't think they had a box small enough for the remaining three bites. And now, I am a cochon, full to my eyeballs, which are left to mourn the terrible images it has been left with. But it is a holiday. I feel a responsibility to you, dear reader, to leave you with something that is both French and beautiful.